This was a stunning project designed in conjunction with Hardoor. 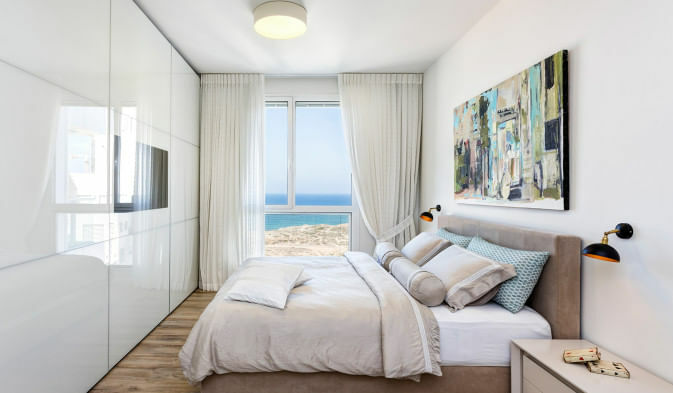 The bedroom in this young, modern apartment overlooking the sea, was not especially spacious, a fact which had to be considered carefully in order to avoid making the space feel even smaller. To achieve that objective we chose a Sesame TV wardrobe in white, allowing for maximum storage in the small space. The wardrobe spreads across the whole width of the wall and right up to the ceiling, creating an impressive screen. The choice of a light colour was also not accidental. Indeed it was essential to help create the illusion of space and depth in the room. In addition, on closing the doors they sit on a level with each other creating a clean, elegant look suitable for the style of the room.